“Assange's critics may cheer, but this is a dark moment for press freedom,” NSA whistleblower and leaker Edward Snowden wrote on Twitter in reaction to seeing WikiLeaks' Julian Assange dragged by UK police from his seven year asylum captivity at the Ecuadorian embassy in London on Thursday. "The UK must resist this attempt by the Trump administration." The arrest came, as WikiLeaks predicted, a mere days after the organization was tipped off that Ecuador was preparing to swiftly end Assange's asylum and hand him over the UK authorities, after which it's further believed the WikiLeaks founder will be extradited to the United States. As we reported Assange's lawyer has confirmed that he was arrested not solely on charges stemming from skipping bail in the UK, but in connection with an extradition request from the US. 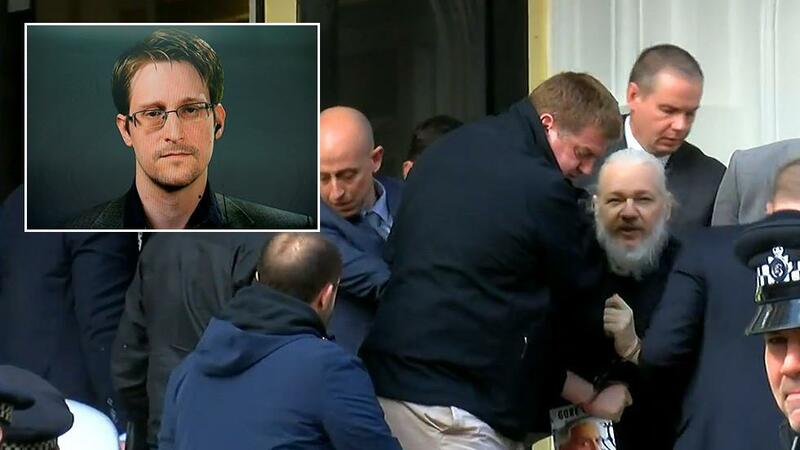 Notably Snowden pointed to the presence of UK "secret police" as part of the operation, some of which had been filmed staking out near the front door of the embassy in the days leading up to the arrest. Snowden also pointed out that "the United Nations formally ruled his detention to be arbitrary, a violation of human right" and followed in the wake of the arrest with: "Regardless of what you think of the man as a person, if you believe in human rights law, this matters." Hours after Assange was loaded into the police van, WikiLeaks confirmed he'd been taken to Westminster Magistrates court, noting "He has been arrested under a US extradition warrant for conspiracy with @xychelsea for publishing classified information revealing war crimes in 2010."